Leaked emails and other documents show how Aquino, Garin and Hartigan-Go magnificently orchestrated the approval of the untested Dengvaxia vaccine... and how they broke more than a few laws in the process. But before that, here's a recap of recent developments. “…iyan po ay mabuting balita doon sa 830,000 na mga nanay-tatay na naaabala’t natatakot na baka may banta sa buhay ng kanilang mga anak,” Roque added. Roque misinterpreted the UP-PGH report. ThinkingPinoy spoke via phone with Department of Health Undersecretary Eric Domingo, who heads the Dengue Task Force technical committee that asked the University of the Philippines​ - Philippine General Hospital​ to create the Expert Panel on Dengvaxia. “Baka si Harry Roque, hindi niya naintindihan yung report. Actually, hindi pa niya nakikita ang report. Ang nakakita pa lang ng full report, sigurado ako, ako pa lang at si Sec. Duque,” Domingo added. “Ang sinasabi nga natin, sigurado nang may na-dengvaxia at namatay siya ng dengue kaya kailangan silang bantayan at alagaan, yun yung [essence] ng report,” Domingo said. Domingo corrected Roque’s interpretation of the PGH report. “Yung anim na namatay, parang may pre-existing conditions so hindi dapat nag-mass immunization na tusok nang tusok. Mali talaga, hindi talaga dapat siya ginawa,” Domingo added. Coincidentally or not, both the Public Attorney’s Office (PAO) and the UP-PGH expert panel are conducting investigations on the same number of alleged Dengvaxia victims, so that Roque’s February 3rd announcement may have led to some confusion as it was interpreted by some people as an assessment of the 14 cases being handled by PAO. Further exacerbating the confusion was Roque’s statement that, given his awareness of PAO’s efforts, can easily be interpreted as a swipe against PAO. [TRANSLATION: If you can recall, the DoH requested the UP-PGH to investigate (the Dengvaxia Scandal) so there can be an objective study of the actual effects of Dengvaxia.] PAO swiftly reacted to Roque’s announcement. Health undersecretary Domingo confirmed PAO’s claims. One of the several Dengvaxia cases being handled by PAO. But the misinformation doesn’t stop with Roque, because we also have former Health Secretary Esperanza Cabral doing her part. “We urge the Department of Justice to order the Public Attorney’s Office (PAO) to stop performing autopsies on these children and leave the matter of determining the cause of death [of the children who received the Dengvaxia vaccine for free] to competent forensic pathologists,” Doctors for Public Welfare (DPW), which is led by former Health Secretary Esperanza Cabral, said in a statement on Saturday [GulfNews]. 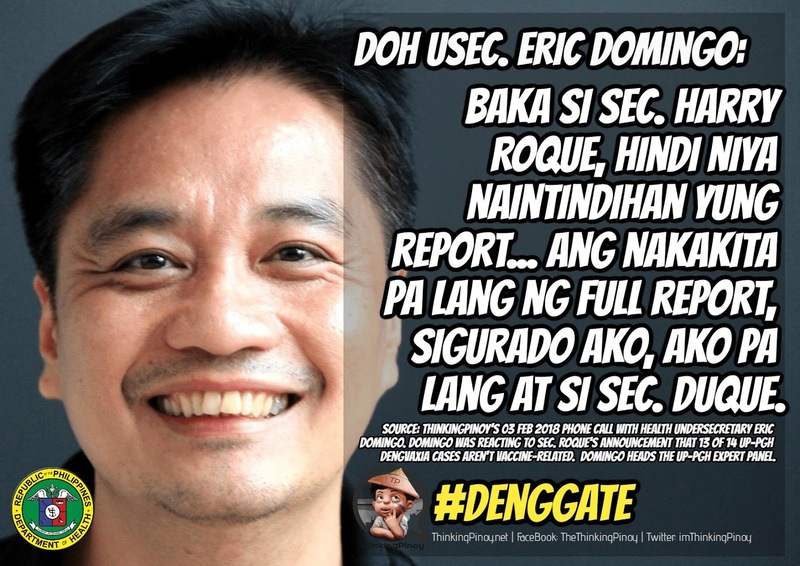 Cabral, like Roque, clearly took a swipe at the Public Attorney’s Office, which was mandated by the Deparment of Justice to provide legal assistance to the families of Dengvaxia victims. 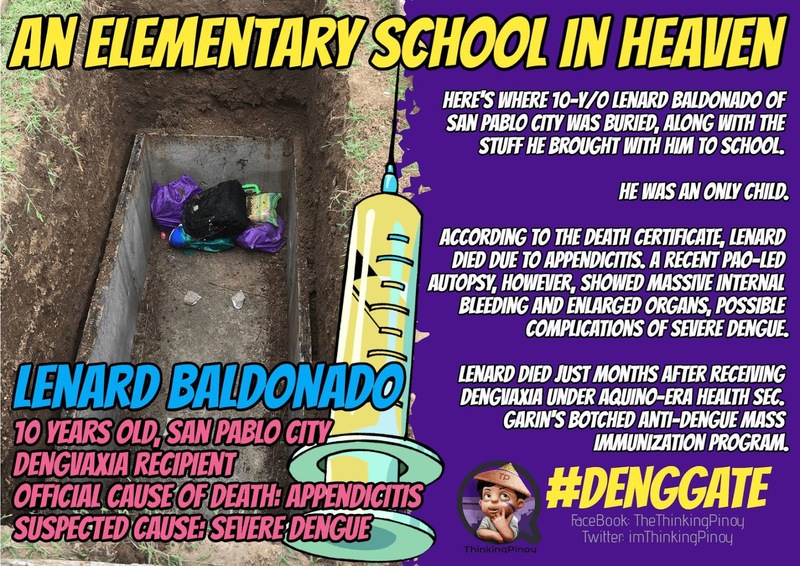 “In fact, the deaths of 13 of them were totally unrelated to the [Dengvaxia] vaccine,” the DPW said. Health undersecretary Domingo has clarified this issue in the previous section, i.e. the UP-PGH expert panel never said that 13 of the 14 cases handled by UP-PGH are unrelated to Dengvaxia. Where did Cabral base this information from, especially since she’s not even part of the UP-PGH panel to begin with? Cabral and DPW’s uncanny enthusiasm to defend Dengvaxia is disconcerting, to say the least. According to sources within the PAO, it was Cabral who convinced DOH officials to continue the Dengvaxia program after Aquino stepped down. 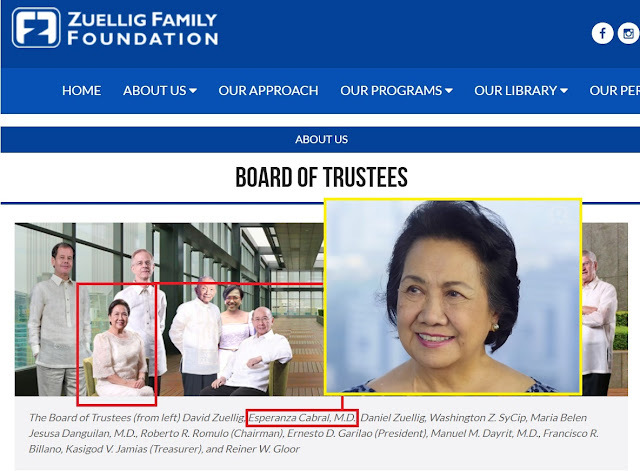 But then, it appears that it actually is in Cabral’s personal interest to defend Dengvaxia, because she is a Trustee of the [Zuellig Foundation] [A]. Former Health Sec. Cabral is Zuellig Foundation Trustee. Zuellig Pharma is Dengvaxia's exclusive distributor in the Philippines. Zuellig Foundation’s parent company, Zuellig Pharma, is the exclusive distributor of Sanofi’s Dengvaxia in the Philippines. In fact, the anomalous P3-billion purchase order for Dengvaxia was addressed not to Sanofi Philippines, but to Zuellig Pharma. Sec. Cabral, the flag-bearer of Doctors for Public Welfare, is part of the “Sanofi-Zuellig Family”. Now that can explain her enthusiasm. She fights not for this country, but for her personal interests. Since the Dengvaxia Scandal erupted in November 2017, there have been several calls by so-called experts to depoliticize the problem, as they claim Mixing that public health should be the paramount concern, and the legal issues as, somewhat, a secondary priority. But therein lies the fundamental problem: it is the politicization of public health that got the country into this mess. ThinkingPinoy agrees that the Health Department should take a more aggressive stance in addressing the Public Health issue arisingfrom the Dengvaxia Scandal. Going after erring officials, however, is just as important. Putting corrupt officials who were instrumental in creating this mess is the best way to restore the general population’s trust in Philippine Public Healthcare, trust that was lost after the previous administration decided to roll out an insufficiently tested drug en masse. 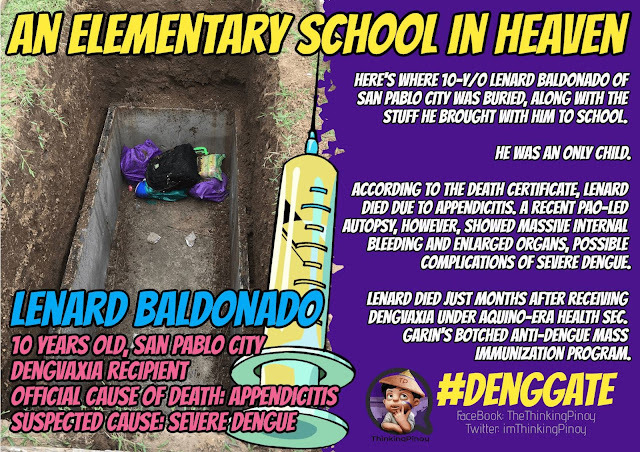 With that said, however, ThinkingPinoy believes that establishing the causal link between Dengvaxia and the deaths should best be entrusted to medical professional who have the requisite knowledge, experience, and integrity. The politics part of the issue, however, is well within ThinkingPinoy’s domain, and that’s what shall be discussed next. The question on whether there was undue haste in the government’s procurement of Dengvaxia need not be asked. At this point, it is now question of how hasty the procurement process was, who exactly did what in the railroaded procurement process, and whether their actions are merely coincidences or whether there was a deliberate effort to violate the law to favor Sanofi and/or its affiliates. Most of what has been revealed so far are a few testimonies from Senate Hearing resource persons but there’s little in the way of actual direct documentary evidence showing the Health Department’s hand in railroading the procurement process… and that’s what we’ll help provide right now. 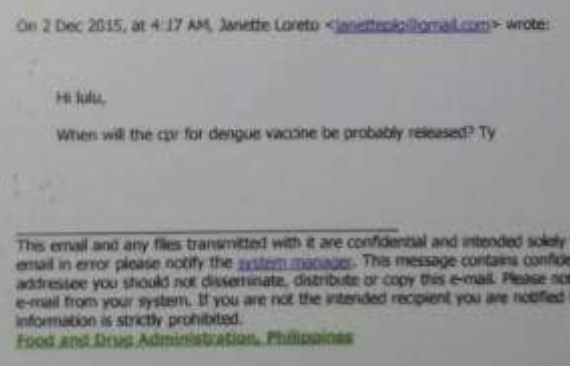 An FDA official who can't stomach the corruption in the Public Healthcare System contacted ThinkingPinoy to provide him with copies of internal documents showing several officials from the FDA and DOH actively moving to railroad the approval of Sanofi-Pasteur’s Dengvaxia. 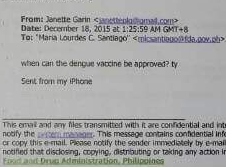 On 11 March 2014, Sanofi Regulatory Affairs Manager Jervin Papelleras sent a letter addressed to then FDA director Kenneth Hartigan-Go and FDA Center for Drug Regulation and Research (CDRR) head Lourdes Santiago. It was a cover letter for the minutes of the meeting between FDA and Sanofi held on 03 March 2014. The letter in itself doesn’t look like it’s anything out of the ordinary. What’s troubling, however, are the attachments. According to the minutes attached to this letter, Sanofi in 2014 was discussing with FDA its “registration strategy in 2015, following the last meeting with FDA in 2012”. Why is Sanofi consulting the FDA about its “registration strategy” when all the information about product registration is readily available in the [FDA website]? Sanofi is a gigantic pharmaceutical firm, so why would it even need to personally coordinate its registration with FDA officials when they must already be very familiar with the process? 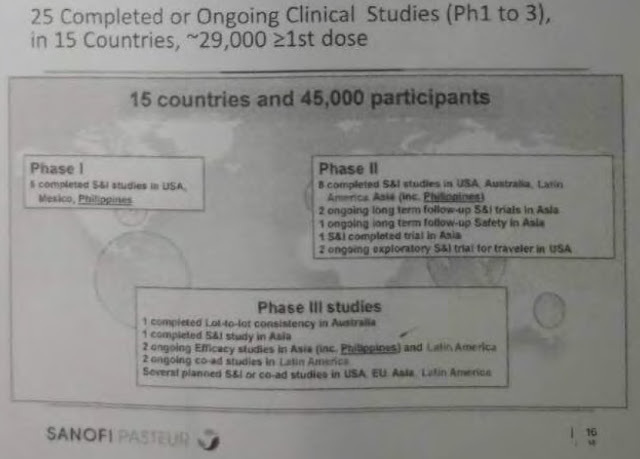 That is, FDA was actively helping Sanofi register a product that, at that time, has completed only its Phase II trials. That is, FDA was helping Sanofi register Dengvaxia even if Dengvaxia was still, by all intents and purposes, an EXPERIMENTAL drug. This is wrong. The FDA is a regulatory body that approves or rejects registration applications, it should not be in the business of coordinating the marketing efforts of pharmaceutical companies, especially those involving untested products! 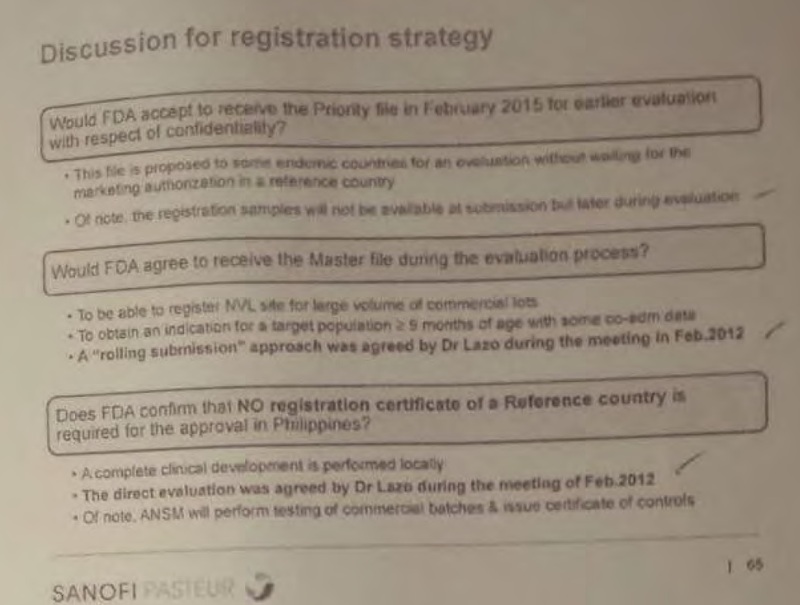 The image above is a screenshot of the Sanofi’s proposed Dengvaxia registration timeline as submitted to FDA. The first column refers to the stage of registration while the last column shows the pertinent laws and regulations that Sanofi should comply with. ThinkingPinoy takes great interest in one of the cited regulations, which is FDA Circular 2013-004. In December 2017, ThinkingPinoy questioned the credibility of FDA head Kenneth Hartigan-Go when it was found out that Hartigan-Go’s career is too closely intertwined with Zuellig, whose pharmaceutical division is the exclusive distributor of Sanofi Dengvaxia in the Philippines. Hartigan-Go was the head of the Zuellig Foundation prior to joining the Aquino Administration in 2010 and after he left in 2016, he headed the Asian Institute of Management’s Zuellig Graduate School [AIM]. And voila! FDA Circular 2013-004 is indeed in Sanofi’s “Registration Strategy”. Again, why is FDA going out of its way to actively assist Sanofi in legalizing Dengvaxia? FDA’s director is a Sanofi beneficiary, for one. FDA Circular 2013-004 greatly benefitted Sanofi as it accelerated the latter’s marketing efforts. 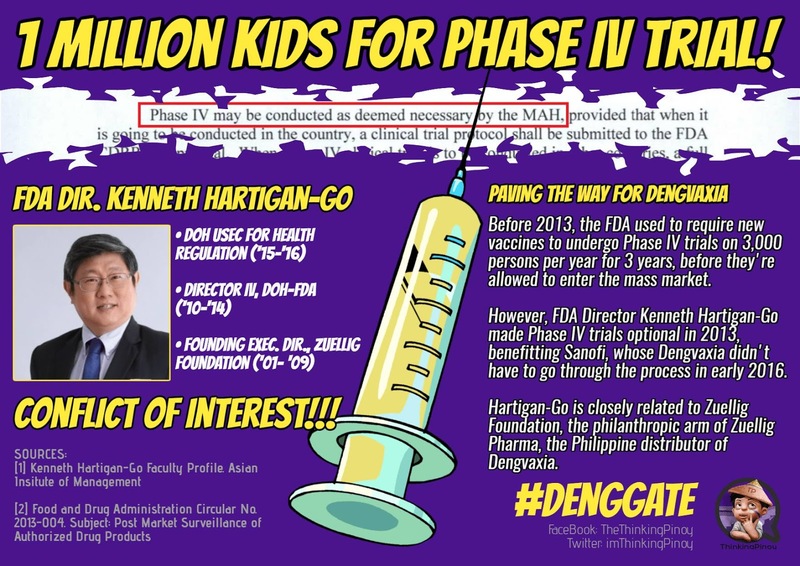 By making Phase IV trials optional, Hartigan-Go allowed Sanofi to mass-market Dengvaxia three years earlier than it would have. Hartigan-Go’s circular made the controversial “Registration Strategy” possible. And it appears that Hartigan-Go wasn’t content with just that: he helped Sanofi all throughout the registration process, and more. We shall go back to Hartigan-Go a little later. Let's talk about the bigger fish first. Garin and Sanofi in May 2015: A Coincidence? At this point, the reader may already have an inkling that the FDA is “in on it”, but the FDA, by itself, cannot orchestrate this entire hullabaloo: it must have the imprimatur from upstairs. 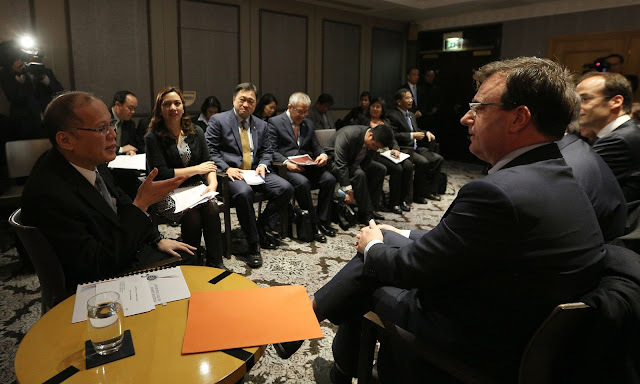 According to Philippine diplomatic records, Garin was in various official engagements in France in May 2015, including a dinner in Paris on May 14, 2015 between Garin and Guillaume Leroy, Vice President of Sanofi-Pasteur’s Dengue Vaccine Program [ABS]. On 18 May 2015, just four days after the Garin-Sanofi meeting, FDA deputy director-general Lourdes Santiago emailed other FDA officials about “Sanofi’s Rolling Submission of Dengue Vaccine”. FDA and DOH’s collective enthusiasm over Dengvaxia would have been acceptable if there was a massive dengue epidemic in the country. According to sources from the Deparment of Health, while there are seasonal dengue fever outbreaks, there has never been a dengue outbreak of epidemic proportions in recent history. Another email provides more clues. 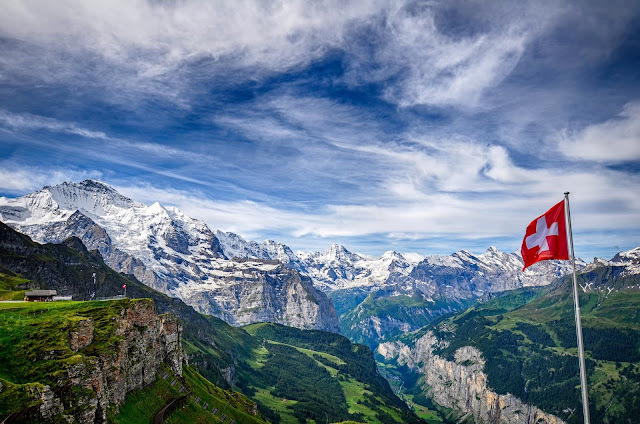 This email shown in the image belowis an 11 May 2015 invitation for FDA officials to attend a World Health Organization conference in Switzerland about Sanofi’s Dengvaxia, at the time still called CYD-TDV. Healthcare industry veterans that Thinkingpinoy consulted said that given modern telecommunications, these trips are just junkets that pharmaceutical companies give to industry decision-makers to curry their favor. PNoy and Sanofi in December 2015: Another Coincidence? On 02 December 2015, the [Official Gazette] reported that officials of Sanofi Pasteur met with President Aquino in Hotel Scribe in Paris. With Aquino were Health Secretary Janette Garin, Finance Secretary Cesar Purisima, Trade and Industry Secretary Gregory Domingo and Transportation and Communications Secretary Joseph Emilio Aguinaldo Abaya. A photo of their meeting is shown below. CPR is the Certificate of Product Registration, a document issued by the FDA that serves as the license for a product which, in this case, is Sanofi’s Dengvaxia. “Ok. Please keep me posted. TY,” Garin replied. 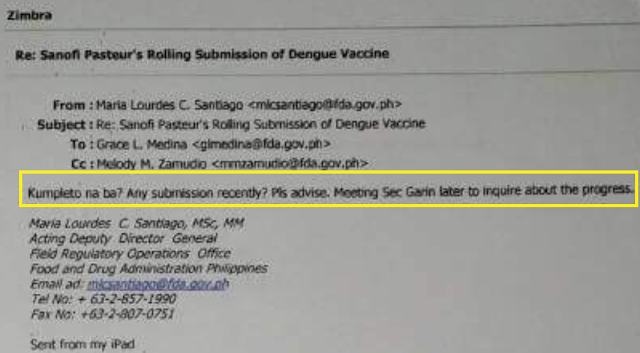 Did Garin ask (and obviously, pressure) FDA about Dengvaxia just because she felt like it? Garin didn’t ask the FDA if it will approve Dengvaxia or not: she asked when FDA shall approve it! Changing the Rules to benefit Sanofi? 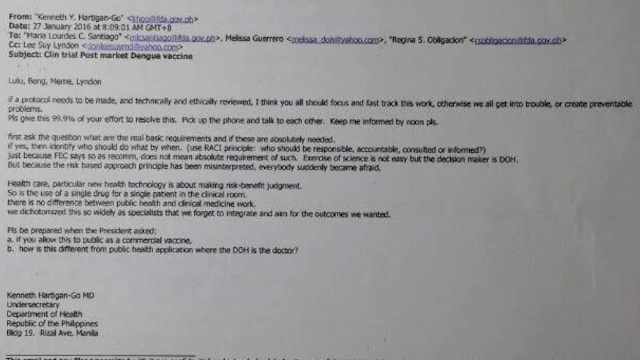 A month later, another leaked email from former FDA head and then Health undersecretary Kenneth Hartigan-Go (yes, the same guy who made Phase IV trials optional) reveals very disturbing reality: that the Aquino-era DoH really intended to bend the laws to benefit Sanofi. After getting its hastily-issued FDA Certificate of Product Registration (CPR) in December 2015, Dengvaxia’s fate was transferred into the hands of the Formulary Executive Committee (FEC). In simple terms, a CPR makes a new product legal to sell, but it requires an additional FEC clearance to allow the government to buy it. That is, an FEC clearance is required for the Aquino Government to buy P3 billion worth of dengue vaccines from Sanofi. Without FEC or an FEC exemption, that would not be even in the least bit legally possible. Why did Hartigan-Go say this? Dengvaxia was a newly-registered drug at the time and it has not even completed Phase III trials, let alone Phase IV trials, by the time it was handed over to the FEC approval. FEC regulations require a Post-marketing Surveillance Report (PMS), which would have existed had there been a Phase IV trial for Dengvaxia. But as the reader may recall, Hartigan-Go himself made Phase IV trials optional in 2013, while he was still FDA chief. 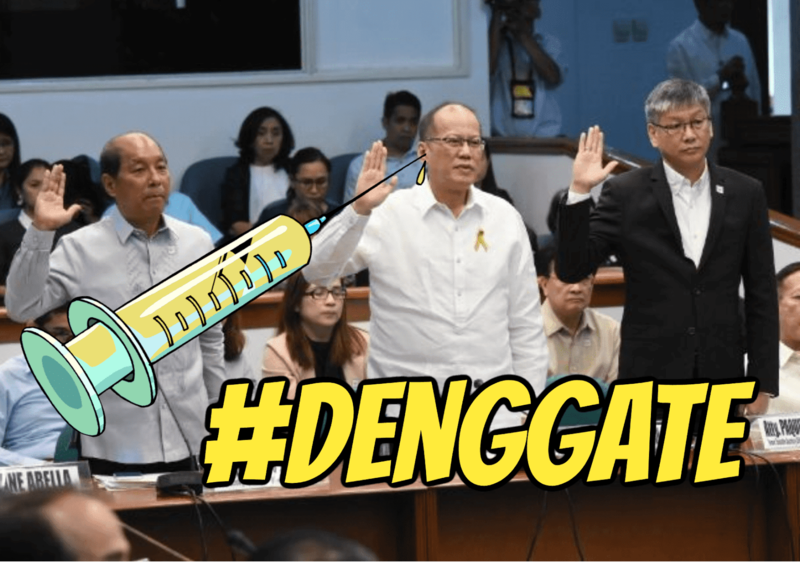 Dengvaxia, at that point, was in limbo: how can the FEC clear Dengvaxia when it is not compliant with existing rules? Here’s where Usec. Hartigan-Go’s message becomes relevant, as he explicitly told regulators that the Aquino Government was willing to change the rules – or even create new regulations (protocols) – to ensure that the government can purchase Dengvaxia. Again, and this bears repeating: there had been no Dengue Epidemics in the recent past. In the same email, Hartigan-Go even gave a heads up to regulators as he informed them of possible questions from President Aquino. What we have seen here is not just simple negligence, but one magnificently orchestrated crime that involves the top officials of the Aquino Administration. ThinkingPinoy agrees with Senator JV Ejercito in that we need a more sober discussion of the #DengGate Scandal. However, that is easier said than done given Sanofi's massive PR operations, including the efforts of former Health Sec. and "Doctors for Public Welfare" head Esperanza Cabral, a trustee of Zuellig Foundation. Zuellig Pharma is the exclusive distributor of Dengvaxia in the Philippines. Some camps dismiss PAO's announcements as mere histrionics, but as the legal counsels of marginalized Dengvaxia victims, it is their job to advocate for their clients, in the same way that Cabral et Al advocate for their Big Pharma benefactors. The Pharmaceutical Lobby has very deep pockets. It's more than probably armed with a war chest bigger than the National Government's. And just like any creature, it will do everything it can - including emptying that massive war chest - to survive. The problem, however, is that Big Businesses are borne not out of altruism, but for the amoral end of profit. Sanofi is not immoral: it is amoral. Without the government giving it considerable incentive to align with Public Interest, it will not do so. Hence, what we need is a government response that definitively displays Political Will to force Sanofi into submission, something that our government, so far, has failed to demonstrate. Needless to say, the current government should go after the corrupt officials that were instrumental in the creation of this Public Health debacle. PAO, despite its flaws, is doing its best to advocate for the victims. Without PAO, this issue would have already been covered up, just like most of the corrupt acts of government officials in the not too distant past. With that said, I wish all other government agencies involved in this mess will show the same kind of tenacity that PAO has been showing since the Dengvaxia Scandal began. Filipino first, dear friends... and neither Sanofi nor Zuellig are Filipinos.